"Sonny's was a talent too big to be denied. For me, he comes immediately after Bird as an alto saxophonist. I don't know anyone who was exposed to his playing who didn't enjoy him." 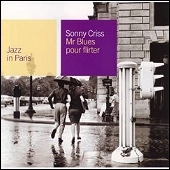 Sonny Criss must be considered one of the great underground musicians of all time. Living in Los Angeles was not conducive to gaining great national erecognition since whatever publicity can be gathered from club dates or concerts somehow gets smogbound on its route over the Rockies. Yet Criss found a way to survive. Every ten years or so he headed for Paris where he knew he had an audience. These periodic leaves of absence were necessary to restore the soul. In addition, Sonny gave a series of concerts for the LA City School system each spring playing for youngsters in classes designed to present a history of jazz. His first major exposure was on some unusual California jam sessions in 1947. His highly passionate "Boppera" solo is well remembered. More jam sessions for Gene Norman and Norman Granz followed, as did his first studio session (for Granz). But the underground reputation really began with his first LP, Jazz USA, for Imperial in 1956. Criss was appearing with Buddy Rich's band at the time the LP was recorded. Imperial was a label that specialized in New Orleans R&B (Fats Domino, Smiley Lewis, The Spiders) and its interest in Sonny Criss didn't extend far enough to include any promotional effort. But that first LP included a masterpiece, "West Coast Blues." The melody is a virtually themeless blues which predates by several years a Wes Montgomery line with the same title. I first heard it on a motor trip with my parents somewhere in Colorado. I know that my initial reaction was "things couldn't be that bad!" Then it was very strange because I heard the tune played on radio at unusual hours of the day on stations that didn't ordinarily program jazz. It was fairly obvious that Criss was getting to people by the force of his own playing. Jazz USA and his other two LPs for Imperial are now very expensive collectors items. His next LP was a very similar situation. 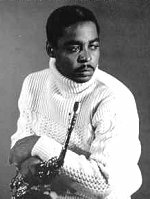 When the Rich band played in Chicago, Peacock Records contacted Criss and an LP was recorded with Wynton Kelly on piano [Sonny Criss At The Crossroads]. Peacock was a Texas label that specialized in blues and gospel. They paid very little attention to their Sonny Criss jazz LP. A three-year association with Prestige Records in the late 60's did much to bring Criss more national recognition. He won the downbeat award for Talent Deserving Of Wider Recognition in 1968 and had a standing ovation at the Newport Jazz Festival the same year. There followed a lot of talk by New York big shots about management, tours, booking and the whole works; but when Criss returned to LA, it turned out that all the talk was just talk. The seventies were not especially good for Criss. The LA slows had set in again, so Criss was off to Paris. Paris this time around involved a brief hospitalization and no recording. Sonny Criss died tragically in mid-November 1977. Muse Records had just resigned Criss and new recordings were planned. It was supposed to be suicide. Those who knew Sonny said it couldn't be. Jazz lost a great one. On November 19, 1977, Criss took his own life. For more than a decade after his death, the reasons for Criss's suicide remained unclear. His playing toward the end was in peak form, and audiences were gradually reacquainting themselves with the pleasures of serious jazz such as Criss had to offer. The mystery of his motive was finally cleared up in 1988 when Lucy Criss revealed that her son was suffering from stomach cancer at the time of his death: "He kept still about it and worked for as long as he could." One can easily imagine Criss remaining silent; he was an introspective man, one who carried both his disappointments and his joys quietly within himself. Criss rarely complained about whatever troubles he faced, medical or otherwise. Just as rarely did he dwell on his achievements or his hopes for the future. He let his music speak for him. Over a decade after his death, it still does. 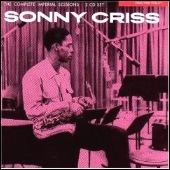 A selected discography of Sonny Criss albums. California Bop, 1947, Fresh Sounds. At The Crossroads, 1959, Peacock. This Is Criss!, 1966, Prestige. Portrait of Sonny Criss, 1967, Prestige. Out of Nowhere, 1975, Muse.